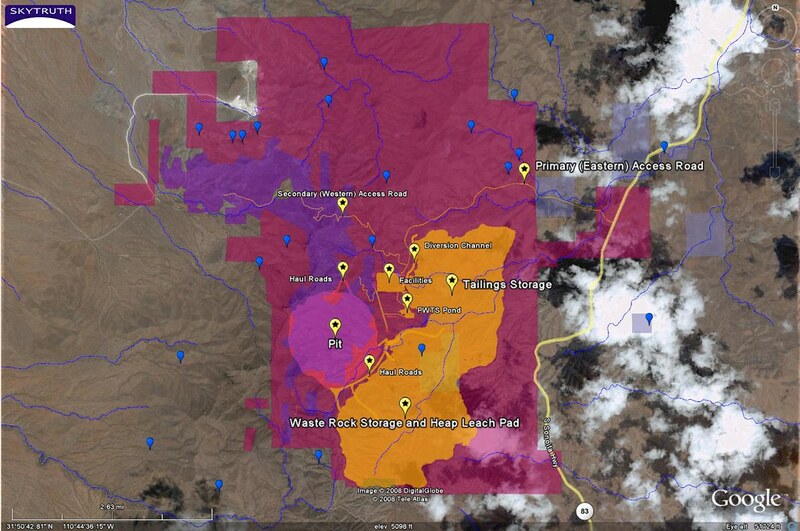 Rosemont mine plan (orange), mining claims (pink), patented mining claims (purple), fee-lands mining claims (blue). Source: Rosemont Mine Environmental Impact Statement website. Locations of natural springs and intermittent streams / washes shown in blue. Sonoita Highway (Scenic Highway 83) shown in yellow. Source: Pima County GIS department. Satellite image backdrop courtesy Google Earth. Location of the proposed Rosemont open-pit copper mine in the Santa Rita Mountains of the Coronado National Forest near Tucson, Arizona. 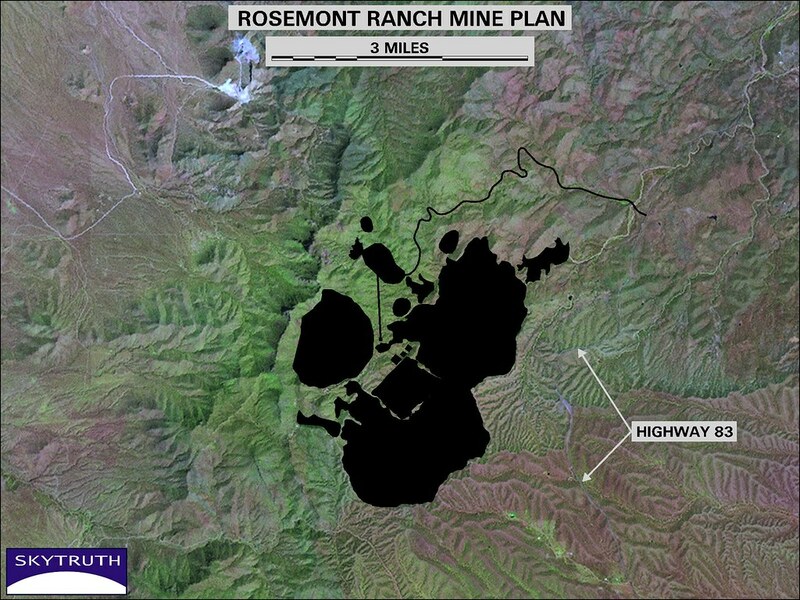 Rosemont mine plan (as of February 2008) shown in orange. Source: Rosemont Mine Environmental Impact Statement website. Locations of natural springs and intermittent streams / washes shown in blue. Sonoita Highway (Scenic Highway 83) shown in yellow. Source: Pima County GIS department. Satellite image backdrop courtesy Google Earth. Location of the proposed Rosemont open-pit copper mine in the Santa Rita Mountains of the Coronado National Forest near Tucson, Arizona. Locations of natural springs and intermittent streams / washes shown in blue. Sonoita Highway (Scenic Highway 83) shown in yellow. Source: Pima County GIS department. 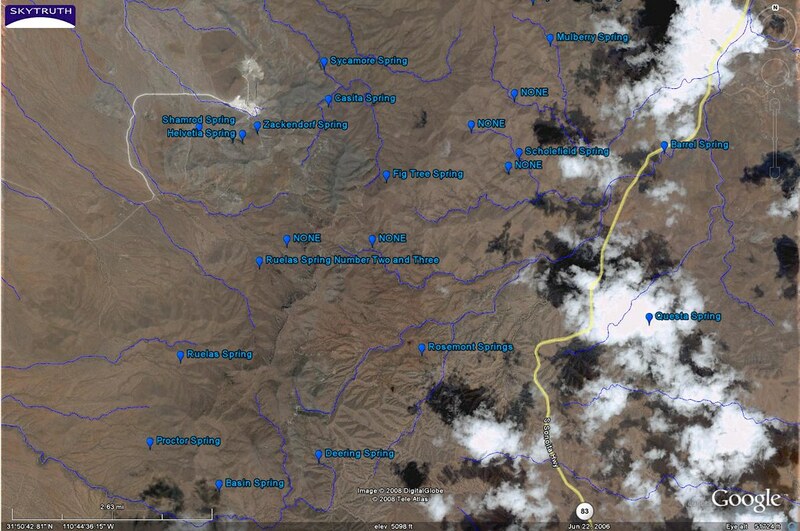 Satellite image backdrop courtesy Google Earth. Location of the proposed Rosemont open-pit copper mine in the Santa Rita Mountains of the Coronado National Forest near Tucson, Arizona. Sonoita Highway (Scenic Highway 83) shown in yellow. Satellite image courtesy Google Earth. 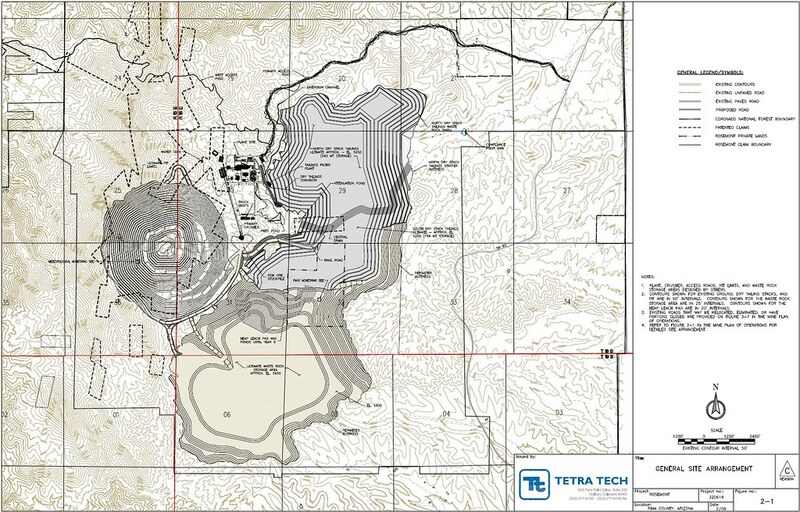 Official plan (as of February 2008) for the proposed Rosemont open-pit copper mine in the Santa Rita Mountains of the Coronado National Forest near Tucson, Arizona. 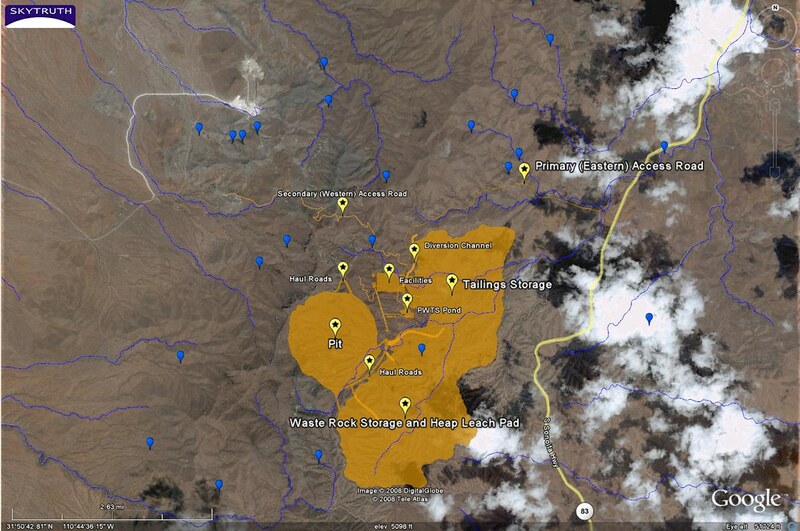 Downloaded from Rosemont Mine Environmental Impact Statement website on 2/17/11. 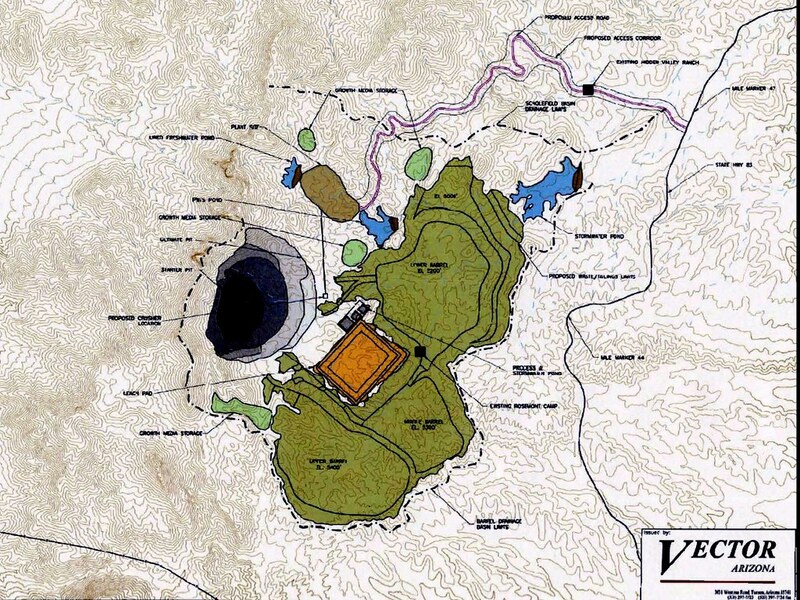 Earlier (pre-2008) schematic plan for the proposed Rosemont open-pit copper mine in the Santa Rita Mountains of the Coronado National Forest near Tucson, Arizona. 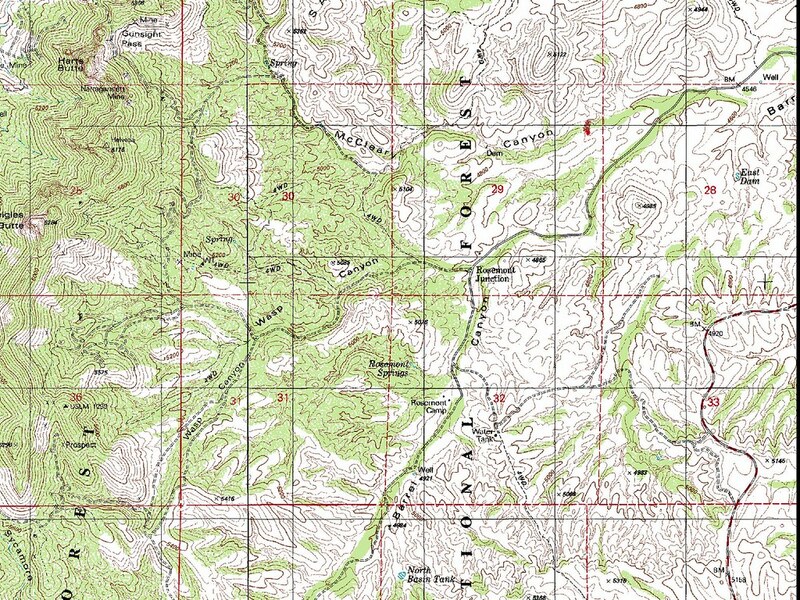 Topography and geographic features in the area of the proposed Rosemont open-pit copper mine in the Santa Rita Mountains of the Coronado National Forest near Tucson, Arizona. Digital raster graphic courtesy US Geological Survey..
Landsat satellite image of proposed mine site, taken on September 12, 2000. 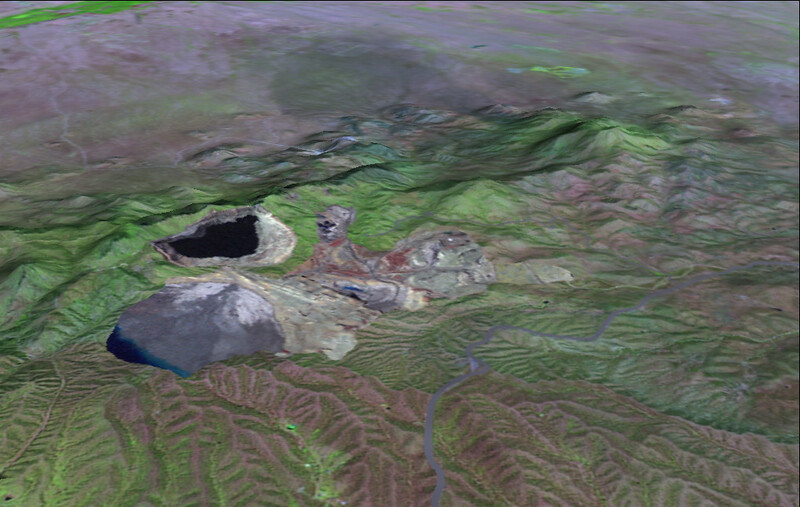 Landsat satellite image of proposed mine site, taken on September 12, 2000. State Highway 83 is shown in black. 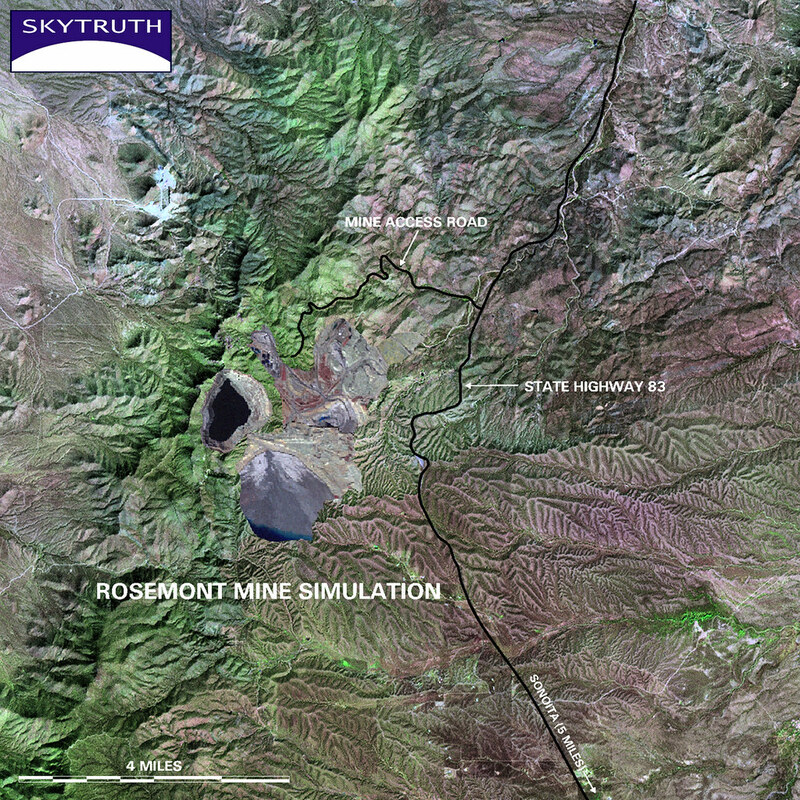 Photorealistic simulation of the proposed Rosemont open-pit mine, superimposed on Landsat ETM satellite image. Based on pre-2008 schematic diagram of mine plan. Proposed access road is shown in black. Existing State Highway 83 (Sonoita Highway) is also shown in black. 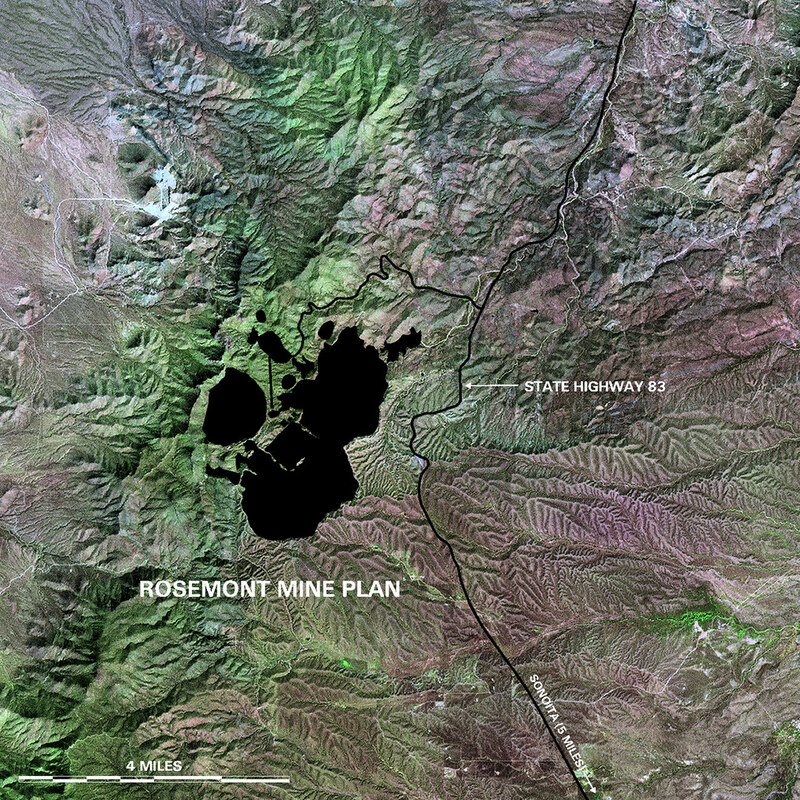 Landsat ETM satellite image, taken September 12, 2000, with pre-2008 version of proposed mine plan shown in black. Includes processing facilities, storage ponds, wasterock piles and tailings impoundments, leach pad, access road and other installations. 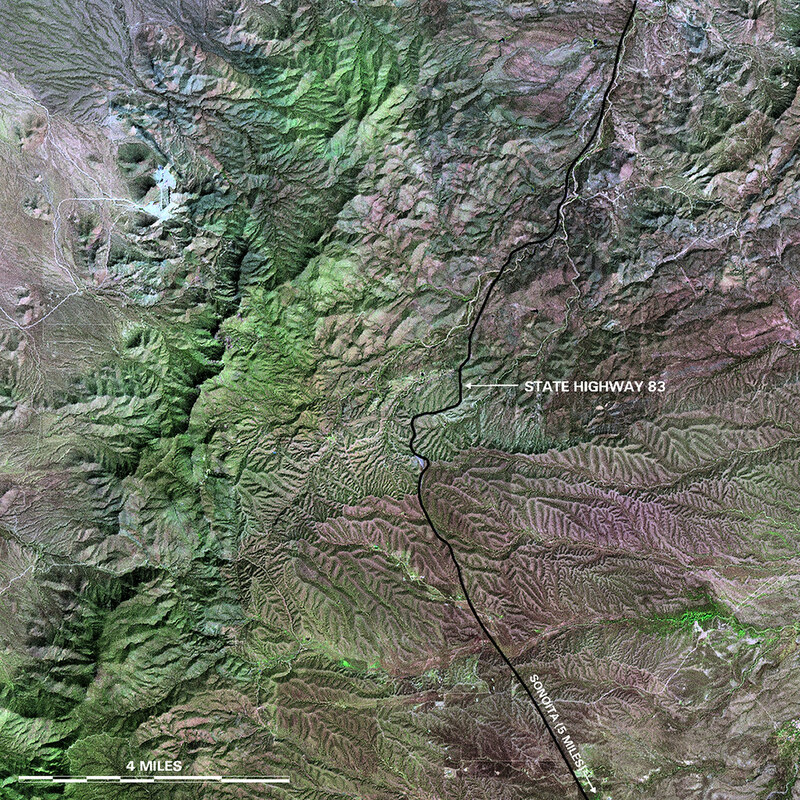 State Highway 83 (Sonoita Highway) is also shown in black. Panoramic view looking northwest over the Santa Rita Mountains, site of the proposed Rosemont open-pit mine. Foreground is 4.6 miles across. Viewpoint is 12,500 ft above State Highway 83 (Sonoita Highway), shown in gray. Bright green area in upper left is community of Green Valley on the Santa Cruz River. 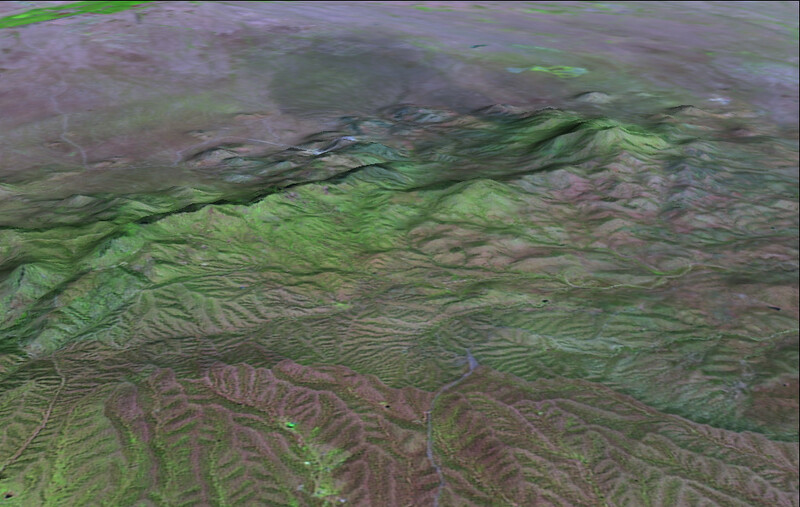 Landsat ETM satellite image taken on September 3, 2000. Panoramic view looking northwest over the Santa Rita Mountains, with simulated rendering of the proposed Rosemont open-pit mine based on pre-2008 version of the mine plan. Foreground is 4.6 miles across. Viewpoint is 12,500 ft above State Highway 83 (Sonoita Highway), shown in gray. Bright green area in upper left is community of Green Valley on the Santa Cruz River. 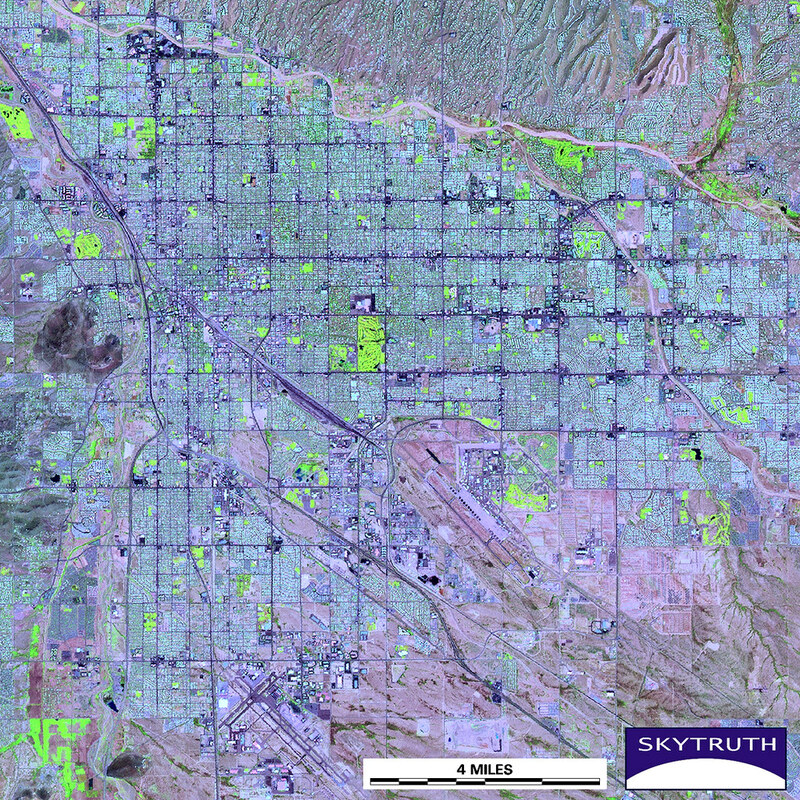 Landsat ETM satellite image of Tucson, Arizona, taken on September 3, 2000. Original file designed to be 7.5" x 7.5" at 200dpi resolution. 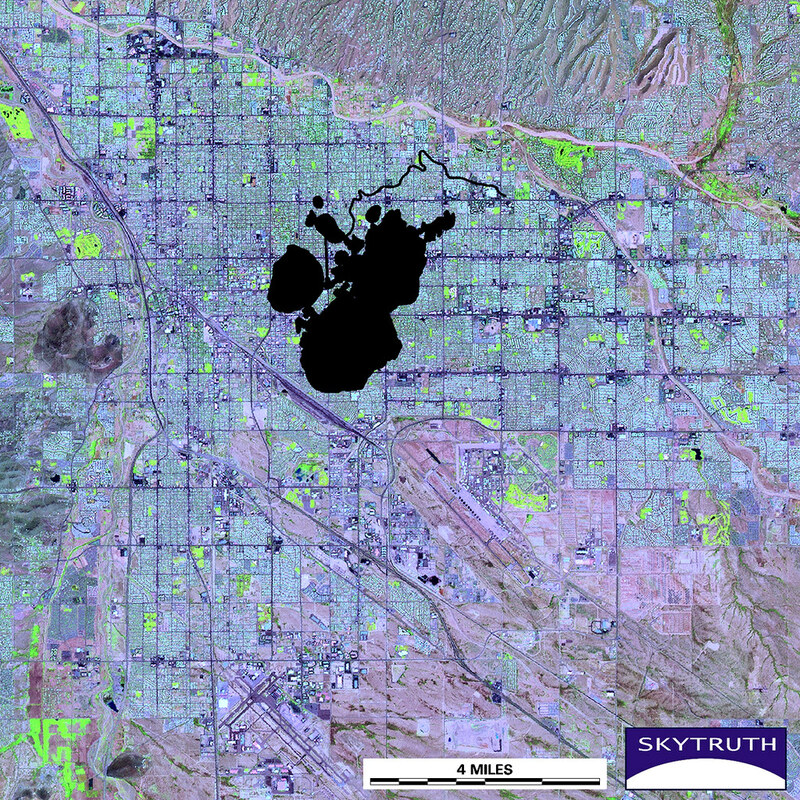 Plan of proposed Rosemont mine (in black) superimposed on Landsat satellite image of Tucson for scale. Based on earlier (pre-2008) version of the mine plan. Original file designed to be 7.5" x 7.5" at 200dpi resolution.